Capsinol Nasal Spray works by desensitising the nose. It contains capsaicin, a natural substance found in peppers. Capsicum is made up of natural Capsaicinoids, including Capsaicin. Several applications of capsaicin to the inside of the nose can make the nerve endings less sensitive to triggers of non-allergic rhinitis. 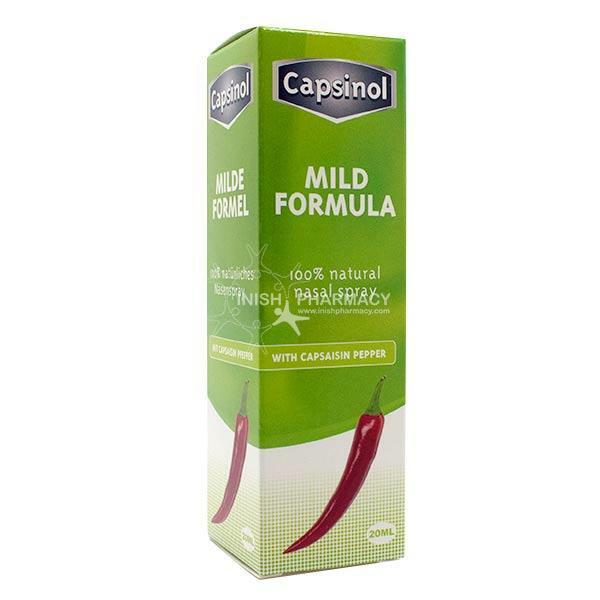 Capsinol is a natural decongestant and can also help in the symptoms of Sinus congestion. All Natural Ingredients: Capsicum, Eucalyptus Oil, Rosemary Oil, Sage Oil, Vitamin C, Dead Sea Salt , Ascorbic Acid, Natural Ethanol, Grapefruit Seed Extract and USP Water. Capsinol Nasal Spray works by desensitising the nose. It contains capsaicin, a natural substance found in capsicum pepper. Capsicum is made up of natural Capsaicinoids, including Capsaicin. Several applications of capsaicin to the inside of the nose can make the nerve endings less sensitive to triggers of non-allergic rhinitis. After the first few sprays, a slight stinging type sensation may be felt but this will disappear after a few days as the nerve endings in the nose become less sensitive. Capsaicinoids also instantly affect the tiny nerve fibers inside the nasal passages causing them to release allergens and other foreign substances including bacteria. Capsinol promotes normal sinus drainage and does not dry out your nasal passages like some antihistamines and decongestants. Capsinol can break up nasal congestion, cleanse and moisturise the nose, keep your nasal passages moist, clean and bacteria free while it prevents allergy triggers. Capsinol is a natural way to treat rhinitis and can also play a role in treating decongestant nasal spray addition, as no rebound effect is seen with Capsicum pepper spray, in contrast to other decongestant nasal sprays.